This beautiful Hummingbird necklace is created in sterling silver with a 12 karat gold filled wire and semi-precious stone soldered on. the artist uses a unique gold and green patina and then coats the piece with an acrylic jewelry sealer so the patina remains true to it's original patina. The pendant is then placed on a cable made of 49 tiny steel cables, bound together and coated with a nylon embedded with gold flake to give it a glowing golden appearance. 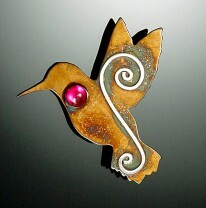 Hummingbirds are a symbol of joy, happiness and love.